Christopher Eads is a Philadelphia based designer-illustrator. He works most adeptly with a mechanical pencil and enjoys sketching, creating concepts and writing in a sketchbook regularly before hopping on to the computer to add finishing touches to work. He is interested and inspired by the rich and always evolving patchwork of cultures, histories, and experiences that make up Philadelphia. 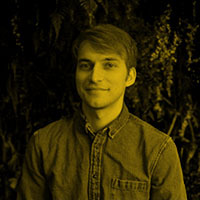 A graduate of Tyler School of Art, he has been a collaborating artist with the Philadelphia Assembled Exhibition at the Philadelphia Art Museum, worked as a designer of children’s books for local publishing firm Running Press, has displayed work with Giovinetti Studios and designed materials for The Leukemia Lymphoma Society, The American Diabetes Association, grassroots organizations and musical artists among others.